Soft,warm,cozy. No matter where you use it--the car, on a flight, or on the bed, its softness does not disappoint. 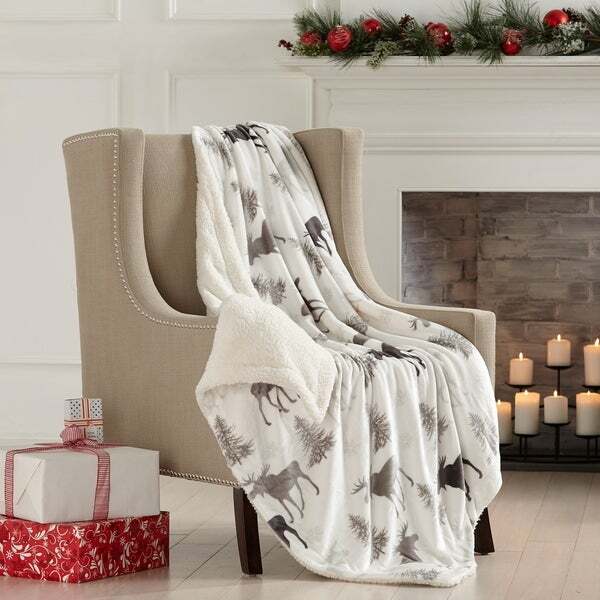 Enjoy plush comfort with this throw. Available with a variety of colors and prints, the throw lends a dash of style to any decor, and its soft faux fur construction provides cuddly warmth. I purchased the Home Fashions Design Reversible Berber Faux-Fur Velvet Plush Throw. I got it to go on my red recliner. It is perfect. Talk about plush. This is the real deal. It’s the perfect size for me and a good book. I love everything about this piece. The colors are vibrant and remarkable. They really beautiful and really stand out in my bathroom. Very well made and should last many years to come. It arrived carefully packed and looks perfect in my bathroom. My bathroom is gold and silver and this gives it the perfect accent color to add pzazz to the bathroom. I'm very happy with this purchase and I recommend this to anyone who likes vibrant colors. Well designed throw. Beautiful. Soft to the touch. Recommend. If I could live under this throw, I would. Talk about PLUSH! The cream color is a true cream and is draped over the gray chaise I bought from Overstock. It looks so nice in my Master Suite. I have gotten a few compliments, as this throw is so nice you might want more than one! Hello, This item is somewhat like I purchased at a local discount store at about half the price.The advantage of that throw is I didn't have to wait over 3 weeks to get it. However nice it would have been to know that upfront I admit it is worth the wait. The quality as a comparison is way better. The softness and overall texture are far superior. Be aware there is some shedding but an acceptable amount. We bought this to add a little color to our couches. It works well with our curtains and accent pillows. It is also very cozy and soft. I am very happy with this purchase. OMG! This blanket feels like a long, warm hug! Super billowy and soft. Color matches my home perfectly. Couldn’t be more happy! So soft and comfortable I love this throw blanket! very pretty and soft, nice size. Color is beautiful and the animals are easy to distinguish. It's like wrapping yourself into a big soft loving hug. I love It! Beautiful gift for a friend. She loved the quality, style, and coziness of this luxurious throw! The price was right too! This is definitely warm and cozy. Three levels up as far as quality compared to the average throw blanket. I use this every day on the couch while watching TV. Soft and easy to cozy up in. Loved it. A really great addition. Wow...Love love love it! So pretty! So soft! The print is not distinct enough for my taste. I don't have a nice throw, and this is a good price plus it's beautiful.